OK. Let’s see now. First is over and down, second is up, across, and up. Third is down, opposite second, and fourth is up, across, and up. Fifth is down, directly opposite forth, sixth is up, across, and up once more. And then seventh, that’s next to me, straight down, opposite sixth. Reverse, when I need it, is right over to the left and up, directly opposite first. This might take a little practice. In world where our headlamps now automatically dip for themselves, our windscreen wipers sense the first drops of a shower, cruise control allows us to rest our feet, radars take care of our braking, and autonomous cars edge ever closer to day-to-day reality, the gearbox in the Aston Martin V12 Vantage S feels gloriously all the more mechanical. There are no flappy paddles. No software trying to select the highest ratio possible as soon as it can. And, because this is an Aston Martin, there’s no redline on the rev-counter either. There’s never been a more enjoyable, or at first more challenging, way of making a 6.0 litre V12 sing. You have to think. You have to concentrate. And you really have to drive this car. Get it right and it feels all the better for it. Elon Musk, the American head of Tesla, may have recently threatened to make all cars self-driving by the time I turn 50 (heaven forbid!). But good old British Aston Martin, they of Prince Charles, hand-rolled aluminium panels and a certain Mr Bond, have also recently announced that they will continue to make cars. And for the foreseeable future should you want them, with three pedals and manual gearboxes. Praise be to that! With 568bhp and 457lbft of torque hiding beneath the V12 Vantage S’s heavily vented bonnet, the truth is, even if you inadvertently shift from first straight to fourth, or second straight to sixth, you’ll probably not even notice. Such is its tractability and surprisingly easy-going nature any ham-fistedness is simply shrugged-off. This hand-built GT simply gets on with the job of conveying you, your passenger, and your weekend luggage in comfort. Motorway cruising speeds equate to little more than to 2000 rpm in seventh and as long as you’re prepared to put up with the inevitable tyre rumble near steam-roller wide rear tyres create, endless gawps from kerbside bystanders, and just 19mpg – as long as you drive carefully that is – you could happily cross continents in this car. It doesn’t take long, though, to realise that that isn’t quite what Aston Martin have in mind. 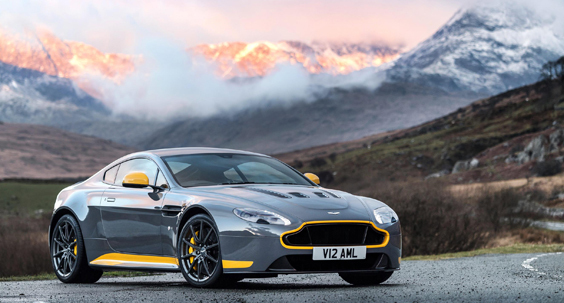 Capable of 0-60 in 3.7 seconds and, where allowed, 205mph, the V12 Vantage S is currently the fastest road-going Aston money can buy. You sit semi-recumbent, your knees higher than your bum, ensconced in a carbon fibre and leather-lined cockpit. Ahead lies a suede wrapped steering wheel and Aston Martin’s trademark four-dial dash. Thankfully an all-important LED gear indicator sits top-dead-centre. You can’t see the end of the bonnet from the body-hugging driver’s seat, but thanks to the Vantage’s beautifully weighted hydraulic (not electric) power steering and nose-heavy nature you instinctively know where it is. Your feet fill the narrow footwell and the ride is best described as taut. It’s never uncomfortable though. 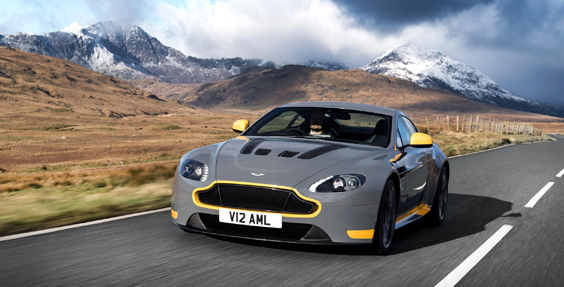 Because of the way the V12 Vantage S feels, driving it is an immersive, all-encompassing experience. Pressing and holding the sport button allows Aston Martin’s AM Shift function to rev-match and make you sound like a heel-and toeing pro. The resultant cackles from the exhaust as you stand hard on the carbon ceramic brakes and change down before turn-in are intoxicating. Powering out of a corner is addictive. Switch off the traction control and your skills will be tested even further: You can make the rear end relinquish its grip even in the dry. It’s a challenge to drive this car in the way it was designed to be driven. And it deserves to be driven. But the rewards for doing it far outweigh the effort. If the rumours are true there’s an all-new Aston Martin Vantage coming out next year. Believe it or not this one can trace its roots back to 2005. Nevertheless the Vantage V12 S, especially with a manual gearbox, proves that when it comes to the current version, Aston Martin definitely left the best until last. Transmission: 7 speed manual with AM Shift, rear wheel drive.